Total Revenue increased 24% yoy to a record $282.3M and exceeded the high end of the guidance range. Premier Agent Revenue increased 21% yoy to $199.5M. The number of Premier Agent advertisers, including brokerages and other teams, spending more than $5,000 per month grew by 70% yoy and increased 64% yoy on a total dollar basis. Total sales to Premier Agent advertisers who have been customers for more than one year increased 41% yoy. Sales to existing Premier Agent advertisers accounted for 63% of total bookings. Other Real Estate Revenue increased 60% yoy to $47.6M. Mortgages Revenue increased 12% yoy to $18.5M. Display Revenue decreased 1% yoy to $16.7M, consistent with the company’s strategy to deemphasize display advertising in the user experience and instead focus on growth in marketplace revenue. GAAP net loss was $77.2M, or (27)% of Revenue, which includes the impact of a $174M non-cash impairment charge recorded in connection with Trulia’s trade names and trademarks indefinite-lived intangible asset. Adjusted EBITDA was $70.9M, or 25% of Revenue. 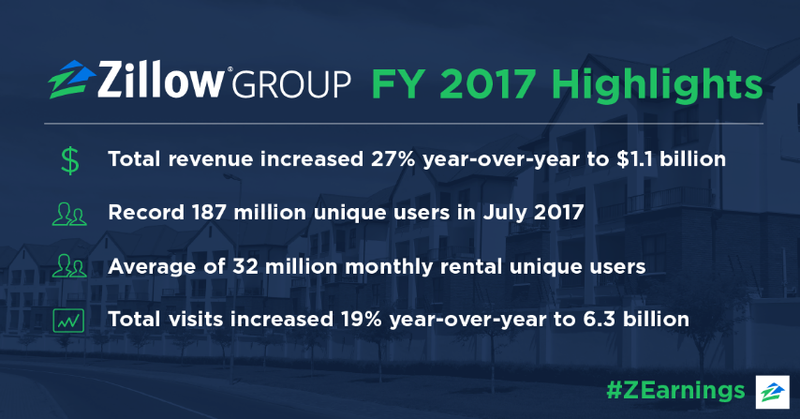 Total Revenue increased 27% yoy and exceeded $1B for the first time in Zillow Group history. Premier Agent Revenue increased 26% yoy to a record $761.6M. Other Real Estate Revenue1 increased 61% yoy to $165M. Mortgages Revenue increased 13% yoy to $80.6M. Display Revenue increased 2% yoy to $69.6M. GAAP net loss was $94.4M, or (9)% of Revenue, which includes the impact of the $174M non-cash impairment charge. Adjusted EBITDA2 was $236.3M, or 22% of Revenue. More than 151M average monthly unique users visited Zillow Group brands’ mobile apps and websites during 4Q17, an increase of 8% yoy. An all-time high of more than 187M unique users visited in July 2017, an increase of more than 17M unique users from July 2016. Visits to Zillow Group brands’ mobile apps and websites Zillow, Trulia, StreetEasy (included as of March 2017) and RealEstate.com (included as of June 2017) increased 21% yoy to more than 1.4B during 4Q17. Premier Agent revenue per visit increased 1% yoy during 4Q17. For FY17, Visits increased 19% yoy to 6.3B. Grow our audience size and increase engagement across all brands – including launching new brands and into new geographies. 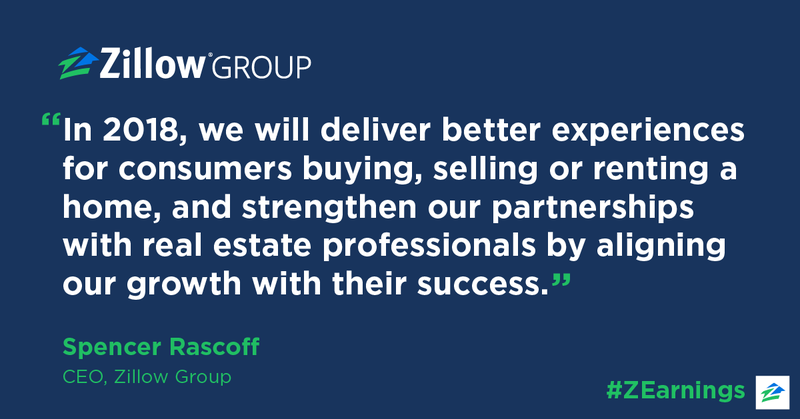 Create better experiences for consumers and more efficiency for our real estate industry partners. This happens as we accompany home shoppers further down the funnel and closer to the transaction. Evolve our revenue models in each marketplace to better align our results with transactions and our industry partners’ commissions at the bottom of the funnel. Attract and retain the best talent and leverage Zillow Group’s unique company culture focused on innovation as a competitive advantage. (1) Zillow Group will begin reporting Rentals Revenue as a separate revenue category beginning with quarterly reporting for the three months ending March 31, 2018. In addition, Display Revenue will be included in the Other Revenue category and not reported separately. Beginning in 2018, Other Real Estate Revenue will be redefined as Other Revenue and will include revenue from New Construction, dotloop, Display, as well as from the sale of various other advertising and business software solutions. (2) A reconciliation of forecasted Adjusted EBITDA to forecasted net income (loss) is provided in the press release in the “Quarterly Results” section of Zillow Group’s Investor Relations website. This communication contains forward-looking statements within the meaning of Section 27A of the Securities Act of 1933 and Section 21E of the Securities Exchange Act of 1934 that involve risks and uncertainties, including, without limitation, statements regarding our business outlook and future operational plans. Statements containing words such as “may,” “believe,” “anticipate,” “expect,” “intend,” “plan,” “project,” “will,” “projections,” “continue,” “business outlook,” “forecast,” “estimate,” “outlook,” “guidance,” or similar expressions constitute forward-looking statements. Actual results may differ materially. For information about potential factors that may affect Zillow Group’s business and financial results, please review the “Risk Factors” described in Zillow Group, Inc.’s Annual Report on Form 10-K for the year ended December 31, 2016 filed with the Securities and Exchange Commission, or SEC, and in Zillow Group’s other filings with the SEC. Except as may be required by law, Zillow Group does not intend, and undertakes no duty, to update this information to reflect future events or circumstances. This communication includes discussion of Adjusted EBITDA, which is a non-GAAP financial measure not prepared in conformity with accounting principles generally accepted in the United States (“GAAP”). This non-GAAP financial measure is not prepared under a comprehensive set of accounting rules and, therefore, should only be reviewed alongside results reported under GAAP. We urge you to review our earnings press release as it contains important information about our financial results, including reconciliation tables and related information about this non-GAAP financial measure. The earning press release is available on the Investor Relations section of the Zillow Group website at http://investors.zillowgroup.com/releases.cfm. It is also included as Exhibit 99.1 to our Current Report on Form 8-K as furnished to the SEC on February 8, 2018, which is available on the Investor Relations section of the Zillow Group website at http://investors.zillowgroup.com/sec.cfm and the SEC’s website at www.sec.gov. Other Real Estate Revenue primarily includes revenue generated by Zillow Group Rentals and New Construction, as well as revenue from the sale of various other advertising and business software solutions and services for real estate professionals. 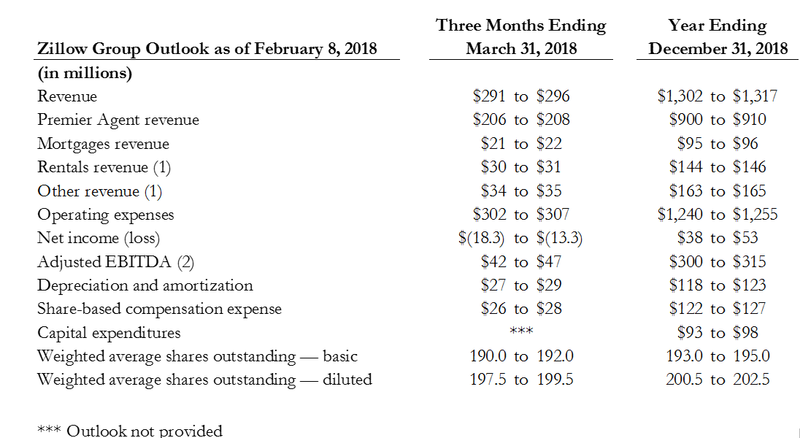 A reconciliation of Adjusted EBITDA to net loss is provided in the press release in the “Quarterly Results” section of Zillow Group’s Investor Relations website. Zillow Group fourth quarter 2017 internal data. Includes Zillow, Trulia, HotPads and StreetEasy.